Summary: Clara Gardner knew that as a part angel she would one day have to fulfill her purpose, rescuing Christian from a forest fire...what she never considered was what might happen if she were to fail. My Opinion: God, where do I start? You know that whole thing where the sequels aren't really ever as good as the first book? I was so worried that this would apply to Hallowed and that I wouldn't like it, but that is so not true. This book blew me away. 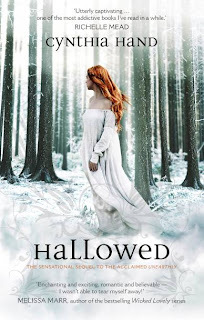 Unearthly and Hallowed are in my top ten of 2011 list because they are both so good. Cynthia Hand writes beautifully; she describes places, Clara's emotions, thoughts and the dialogue clearly and beautifully. Her writing is very pleasant to read and the imagery is vivid. That's what I enjoy about it-- you can almost see it like a movie in your head. For those of you who have read Unearthly, you'll know about the big plot twists and questions left behind in the first book; well, some of those questions (as in, What the hell was Jeffrey doing? and Christian or Tucker?!?!) are answered, some of them not (like, Who is Angela's secret Italian boyfriend!?). Oh, and there are a few big surprises in this book that completely knocked me off track, but I definitely liked one of them. So the plot leaves off a few weeks after Unearthly ended and it's about Clara going back to school and having to deal with the big Christian or Tucker question. Tucker of course is not happy to learn that Christian believes that he and Clara are destined other and Clara feels guilty every time she hangs out with Christian, even though she and him are now friends. She's also having these visions of a funeral and we find out whose it is towards the middle, which left me extremely sad. I love it when I'm emotionally invested in a book because it makes the reading experience so much better, you know? Well wow, this book was one big emotional roller coaster. Some bits made me smile a lot, others had me clutching the book tightly and wondering if our brave protagonists would survive and others? A few tears may have slipped out during a few moments. This book isn't as funny as its predecessor but only because it's a lot more serious. This is about Clara growing up and deciding her future and coping with a huge loss as well as a gain. Clara really shows maturity here and it made me admire her more. My verdict: The ending of this book had me in tears but also gave me hope. 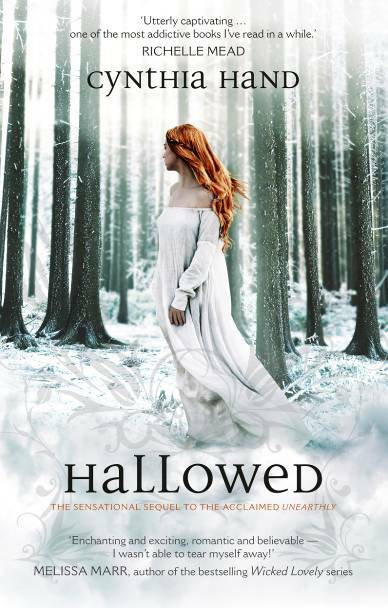 A definite page-turner, Hallowed is a must-read that needs to be at the top of everyone's TBR pile when it comes out in January! Please Welcome Book Faery's New Reviewer!